The defendant or defendants appearing on a criminal charge. A proceeding designed to have a legal effect. An act by an individual aimed at altering, terminating, or otherwise affecting a legal right. A written declaration upon oath made before an authorized official. A claim or assertion that someone has done something illegal or wrong, typically one made without proof. In law, appearance is the coming into court of either of the parties to a lawsuit, and/or the formal act by which a defendant submits himself to the jurisdiction of the court. A court having jurisdiction to review decisions of a trial-level or other lower court. A person who applies to a higher court for a reversal of the decision of a lower court. One who is legally appointed to transact business on another’s behalf; especially : lawyer. Legal permission granted to a person to perform a specified act. Bond provided by an insurance company through a bail bondsman acting as agent for the company. Security given for the release of a prisoner on bail. An officer, similar to a sheriff’s deputy, employed to execute writs and processes, make arrests, keep order in the court. A lawyer entitled to practice in the higher courts of the United Kingdom. The obligation to prove one’s assertion. A person who commits burglary; housebreaker. A suit or action in law or equity. Money that one spouse must give to another spouse (or legal guardian) every month to help care for the children. The civil code in force in the Province of Quebec, Canada, which came into effect on January 1, 1994. To demand by virtue of a right. 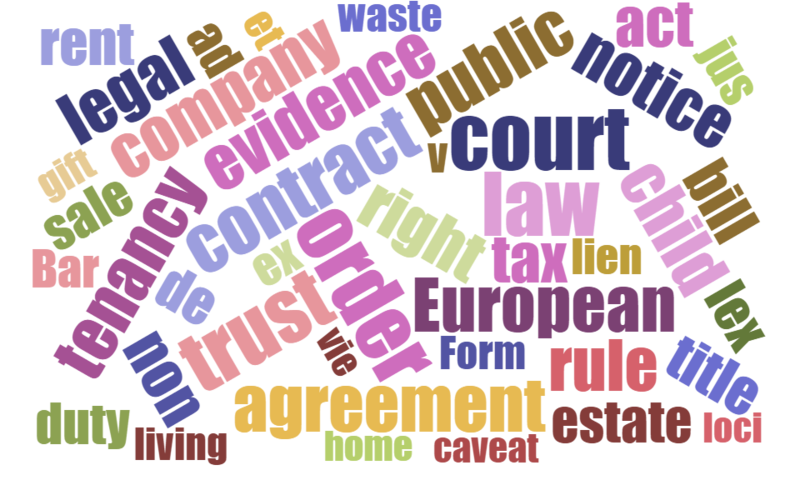 A particular and separate article, stipulation, or proviso in a treaty, bill, or contract. The advantage or benefit of all people in society or in a group. The part of english law that is derived from custom and judicial precedent rather than statutes. Often contrasted with statutory law. To make amends to someone. A plaintiff in certain lawsuits. To express an unfavorable or adverse judgment on. The body of law which defines the relationship of different entities within a state, namely, the executive, the legislature, and the judiciary. A formal agreement between two or more parties. A court is a place where legal matters are decided by a judge and jury or by a magistrate. A court to which appeals are taken in a federal circuit or a state. A direction issued by a court or a judge requiring a person to do or not do something. A public building in which courts of law are held. A history of being convicted for crime. The act of keeping safe or guarding; the right of guardianship of a minor. A sum of money claimed or awarded in compensation for a loss or an injury. Something that is owned or that one is bound to pay to or perform for another. A person or commercial enterprise that owes a financial obligation. A judgment entered in favor of the plaintiff when the defendant defaults (fails to appear in court). A charge or accusation of crime made by an individual before a public prosecutor or tribunal. To bid or allow a person to go. The act of being disimissed, fired from a job. The act of distending or the state of being distended. A calendar of the cases awaiting action in a court. Fair treatment through the normal judicial system, esp. As a citizen’s entitlement. A shelter (as a house) in which people live. To represent or perform in or as if in a play; to act out. Matter produced before a court of law in an attempt to prove or disprove a point in issue, such as the statements of witnesses, documents, material objects, etc. A person who is permitted to testify at a trial because of special knowledge or proficiency in a particular field that is relevant to the case. An area of the law that deals with family-related matters and domestic relations, including: marriage, civil unions, and domestic partnerships; adoption and surrogacy, etc. A serious crime, usually punishable by at least one year in prison. Involving trust, esp. With regard to the relationship between a trustee and a beneficiary. Notification or warning of something, esp. To allow preparations to be made. A jury, normally of twenty-three jurors, selected to examine the validity of an accusation before trial. A real or imagined wrong or other cause for complaint or protest, such as unfair treatment. Culpable of or responsible for a specified wrongdoing. A writ requiring a person under arrest to be brought before a judge or into court, esp. To secure the person’s release unless lawful grounds are shown for their detention. A place where persons are aided in readjusting to society following a period of imprisonment, hospitalization, etc. An opportunity to state one’s case. The state of being confined in prison; imprisonment. To make a formal accusation or indictment against (a party) by the findings of a jury, especially a grand jury. An authoritative warning or order. Persons confined in prison, jails, and other correctional facilities that house those convicted of crimes. A public official with authority to hear cases in a court of law and pronounce judgment upon them. Relating to the science or philosophy of law or a system of laws. An expert in or writer on law. Labour law mediates the relationship between workers, employers, trade unions and the government. Collective labour law relates to the tripartite relationship between employee, employer and union. One that owns and rents land, buildings, or dwelling units. A group of people responsible for insuring obedience of legal rules. A case in a court of law involving a claim, complaint, etc. A proceeding in a court of law brought by one party against another, esp. A civil action. A person who practices or studies law; an attorney or a counselor. Law is a term which does not have a universally accepted definition, but one definition is that law is a system of rules and guidelines which are enforced through social institutions to govern behavior. Free legal advice or representation for a person who cannot afford it. Legal research is “the process of identifying and retrieving information necessary to support legal decision-making. A certain period of time, legally defined, within which an action, claim, etc., must be commenced. A person engaged in a lawsuit. To make the subject of a lawsuit, contest at law. The act or process of litigating. Remaining in an area for no obvious reason. The unlawful killing of a human being without express or implied malice. Intervention in a dispute in order to resolve it; arbitration. A detailed written study of a single specialized subject or an aspect of it. A person authorized to perform certain legal formalities, esp. To draw up or certify contracts, deeds, and other documents for use in other jurisdictions. A public officer or other person authorized to authenticate contracts, acknowledge deeds, take affidavits, protest bills of exchange, take deposition. The action of notifying someone or something. A solemn, formal declaration or promise to fulfill a pledge, often calling on god, a god, or a sacred object as witness. A breach of a law or rule; an illegal act. To disallow the action or arguments of, especially by virtue of higher authority: the defense attorney’s objection was overruled by the judge. To select or impanel (a jury). Of, relating to, constituting, or prescribing punishment. A criminal act in which property belonging to another is taken without that persons consent. An earnest request; an appeal: spoke out in a plea for greater tolerance. A formal statement of the cause of an action or defense. A solemn promise or agreement to do or refrain from doing something. Harm or injury that results or may result from some action or judgment. The release of an offender from detention, subject to a period of good behavior under supervision. Something that induces certainty or establishes validity. To hold a trial against a person who is accused of a crime to see if that person is guilty. A person, esp. A public official, who institutes legal proceedings against someone. The agency, function, r power of a person authorized to act as the deputy or substitute for another. The provincial law society for lawyers in Quebec, Canada. It was founded May 30, 1849, as the Bar of Lower Canada. Beyond reasonable doubt is the standard of evidence required to validate a criminal conviction in most adversarial legal systems. The act of resorting to a person, course of action, etc., in difficulty or danger. An action that can be taken by an individual or a corporation to attempt to remedy a legal difficulty. To succeed in a lawsuit. To obtain from waste. To make a recovery. The disqualification of a judge or jury by reason of prejudice or conflict of interest; a judge can be recused by objections of either party or judges can disqualify themselves. To send back, remit or consign again. An act of asking politely or formally for something. The act or an instance of requesting, esp. In the form of a written statement; petition or solicitation. A defendant in a lawsuit, especially one in an appeals or divorce case. Put an end to the validity or operation of (a decree, decision, or promise). The act of a person or thing that seizes. The act or an instance of seizing. The punishment assigned to a defendant found guilty by a court, or fixed by law for a particular offense. A writ ordering a person to attend a court. The subsitution of one person in the place of another with reference to a lawful claim, demand, or right. A sum of money given or pledged as contribution, payment, investment. The act or an instance of one person or thing following another. A summons is an official order to appear in court. A court with general jurisdiction over other courts; a higher court. Money or something valuable which you give to someone to show that you will do what you have promised. To keep in existence; maintain. A solemn declaration usually made orally by a witness under oath in response to interrogation by a lawyer or authorized public official. One that steals especially stealthily or secretly. A formal examination of evidence before a judge, and typically before a jury, in order to decide guilt in a case of criminal or civil proceedings. An individual person or member of a board given control or powers of administration of property in trust with a legal obligation to administer it solely for the purposes specified. To maintain or affirm against opposition. The locality where a crime is committed or a cause of action occurs. A decision on a disputed issue in a civil or criminal case or an inquest. An intentional relinquishment of some right, interest, or the like. To be hunted or sought in order to apprehend. To give notice to beforehand especially of danger or evil. A commission or document giving authority to do something. Something (as a club, kknife, or gun) used to injure, defeat, or destroy. A person who sees an event, typically a crime or accident, take place. A stand or an enclosure from which a witness gives evidence in a court. A formal order under seal, issued in the name of soverign, government, court, or other competent authority, enjoining the officer or other person to whom it is issued or addressed to do or refrain from some specified act. A crimnial from 12 to 17 years of age.